The Angolan genet or miombo genet (Genetta angolensis) is a genet species endemic to Southern Africa. It is considered common in this region and therefore listed as Least Concern in the IUCN Red List. Little is known about its ecology. The Angolan genet has long light brown coloured fur with dark spots and a continuous dark crested line across the back. Its throat and chest are light grey to greyish black. It has small spots on the front and shoulders. The spots are more numerous and slightly bigger on the sides. In head-to-body length it ranges from 44 to 48 cm (17 to 19 in). Its bushy 38 to 43 cm (15 to 17 in) long tail is ringed with a dark tip. Its legs are dark at the back. It has a dark grey face, a black muzzle and is white around the eyes and mouth. Its crest on the back is up to 6 cm (2.4 in) long. It is distinguished from the common genet by the black rather than white tip to the tail and more irregular blotching and spotting on the coat. Melanistic individuals have been recorded in some areas. The male of the species is larger than the female. 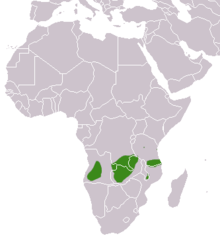 The Angolan genet occurs in Angola, Democratic Republic of the Congo, Malawi, Mozambique, Tanzania, Zambia and Zimbabwe. It lives in a variety of environments in its range, including both the local miombo woodlands and plains. During camera-trapping and transect surveys in Tanzania between 2007 and 2012, the Angolan genet was recorded north of Katavi National Park and in the Rukwa Region. The Angolan genet is not considered threatened by habitat change, but might be negatively affected by road traffic. In Tanzania, traditional healers use the Angolan genet in their practices. Some individuals are poached for this practise. ^ Wozencraft, W.C. (2005). "Genetta angolensis". In Wilson, D.E. ; Reeder, D.M (eds.). Mammal Species of the World: A Taxonomic and Geographic Reference (3rd ed.). Johns Hopkins University Press. p. 554. ISBN 978-0-8018-8221-0. OCLC 62265494. ^ a b Fischer, C. (2013). "Diversity and distribution of small carnivores in a miombo woodland within the Katavi region, Western Tanzania". Small Carnivore Conservation. 48: 60–66. ^ Gaubert, P.; Taylor, P. J.; Veron, G. (2005). "Integrative taxonomy and phylogenetic systematics of the genets (Carnivora, Viverridae, Genetta): a new classification of the most speciose carnivoran genus in Africa". In Huber, B. A.; Sinclair, B. J.; Lampe, K.-H. (eds.). African Biodiversity: Molecules, Organisms, Ecosystems. Proceedings of the 5th International Symposium of Tropical Biology, Museum König, Bonn (PDF). Springer. pp. 371–383. ^ Foley, C.; Foley, L.; Lobora, A.; De Luca, D.; Msuha, M.; Davenport, T. R.; Durant, S. M. (2014). A Field Guide to the Larger Mammals of Tanzania. Princeton University Press. ^ White, P. (2000). ""Genetta angolensis" Angolan genet". Animal Diversity Web. ^ Kingdon, Jonathan (1997). The Kingdon Field Guide to Africa Mammals. Academic Press. p. 269. ISBN 0-12408355-2. ^ "Genetta angolensis - Angolan Genet. Distribution". Encyclopedia of Life. Retrieved 26 October 2016. ^ Fischer, C., Tagand, R. and Hausser, Y. (2013). Diversity and distribution of small carnivores in a miombo woodland within the Katavi region, Western Tanzania. Small Carnivore Conservation 48: 60–66. Wikimedia Commons has media related to Genetta angolensis.